The United States Congress designated the Little Jacks Creek Wilderness (map) in 2009 and it now has a total of 50,930 acres. All of this wilderness is located in Idaho and is managed by the Bureau of Land Management. The Little Jacks Creek Wilderness is bordered by the Big Jacks Creek Wilderness to the southeast. 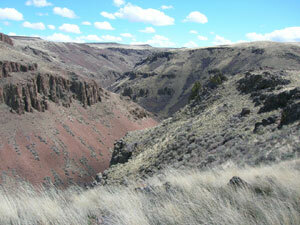 The Little Jacks Creek Wilderness includes a basalt dome covered by sagebrush and grass. Elevations range form 3,500 to nearly 5,900 feet in this Wilderness and magnificent 1,000-foot canyons tower over meandering creeks that provide outstanding high-desert scenery, solitude and many recreational opportunities. The perennial streams and dense riparian vegetation attracts mule deer, sage grouse and mountain quail. Temperatures...best enjoyed from September through mid-November. Planning to Visit the Little Jacks Creek Wilderness? How to follow the seven standard Leave No Trace principles differs in different parts of the country (desert vs. Rocky Mountains). Click on any of the principles listed below to learn more about how they apply in the Little Jacks Creek Wilderness.